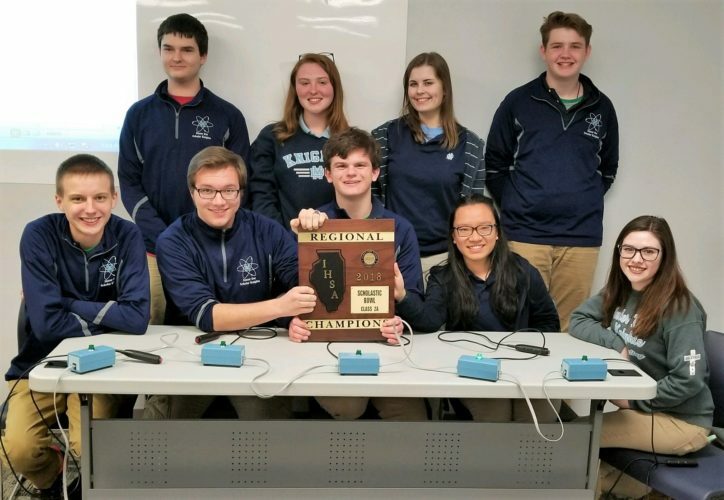 Pictured after winning the IHSA Class 2A Scholar Bowl Regional on March 5 are Scholar Knights (front, from left) Nick Toennies, John Hund, Ben Logullo, Mai Khuc, Abby Kay; Dakota Hemker, Taylor Foster, Abby Brandenburger, and Ben Wilke. On March 5, the Scholar Knights hosted the IHSA Class 2A Scholar Bowl Regional Tournament, a single elimination tournament with eight teams. In the quarterfinal round against Olney, Mater Dei built a 410-40 halftime lead on their way to a 720-130 win. Facing Centralia in the semifinals, the Knights again built an impressive halftime lead (370-70) and won 560-210. In the championship against Effingham, Mater Dei led 270-150 at halftime, converted nine of twelve second-half toss ups, and won the Regional Championship 540-220. For the tournament, Mai Khuc led the Scholar Knights with a total of eighteen toss-ups, followed by Ben Logullo (16), John Hund (9), Nick Toennies (6), Taylor Foster (2), Abby Brandenburger (1), Dakota Hemker (1), and Abby Kay (1). Ben Wilke also contributed to the victories. The Knights entered the IHSA Class 2A Scholar Bowl Sectional Tournament March 10 with a 74-10 record.